Been absent for a while because its the winter and there isn’t a whole lot to talk about gear-wise, but I wanted to drop-in and throw some college stuff at ya if you haven’t already seen them around. 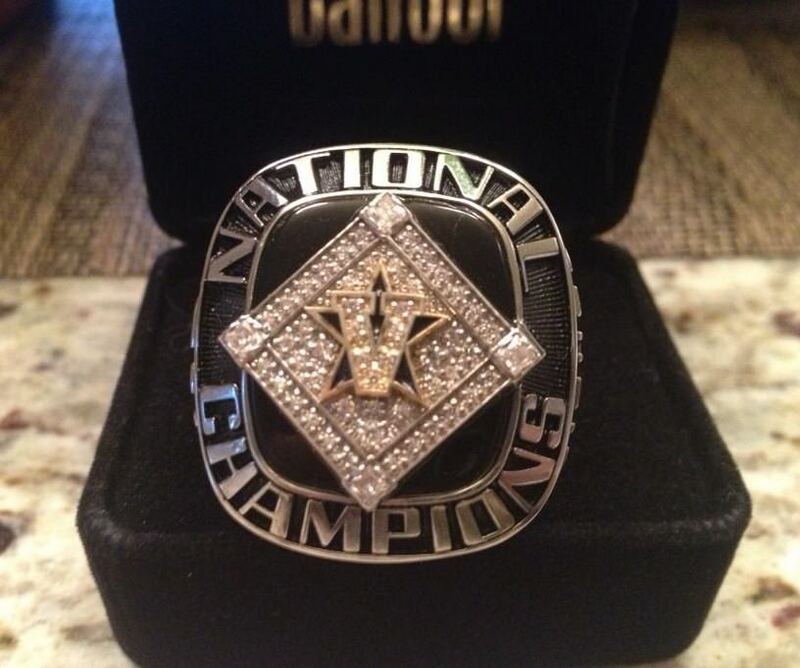 Above, the only gear that really matters, Vandy’s 2014 ‘ship ring. Always in style. David Price showed up on campus looking like money in head-to-toe Jumpman apparel. The 12 Gamma Blues on Price’s feet are only available on the secondary market (eBay), and without a doubt there are fakes at that link. As far as presentation goes, Vandy equipment nailed it here. Dropping some mint custom leather—the baseball equivalent of “A Spoon Full of Sugar”—on top of the playbook just makes it a little bit easier to digest. Louisiana-Lafayette coach Anthony Babineaux gave us a peek at the Ragin’ Cajuns new cleats for 2015, the adidas Energy Boost Icon (top) and custom Excelsior Pro (middle, bottom). I’m a fan of the Energy Boost Icon, not so much the Excelsior Pro. South Carolina gets some of the first custom Under Armour Deception DT cleats we’ve seen in a sick colorway. Get a pair of those in several colors here. Under Armour paired the cleats with a really nice pair of Yard turfs, seen above. Get those here. Photos courtesy of @SCBaseballEquip. Get those in several loud colorways here. TCU got their custom Easton BG’s in, too. Couldn’t find an equivalent for sale. We showed you these on our Instagram, but here’s a few other looks at Texas’ Nike Air MVP Pro 2 cleats. I mistakenly called them MVP Elite 2 (though the shoes are basically identical), but apparently without the Air Max sole, Nike decided to call these by a different name. Get either of them here. Photos via @UTBaseballEQ. Here’s a look at UT’s weight room shoes, the Nike Free Trainer 5.0. I can personally attest these shoes are incredibly comfortable and versatile. Get them here. UT backstops Tres Barrera, James Barton, and Michael Cantu’s new leather for 2015. Barrera’s a Rawlings Pro Mesh, Barton’s a Pro Preferred, and the freshman Cantu with a Wilson custom A2000. As we’ve shown in the past, UT ballplayers get treated like pros, getting the pick of the litter on pretty much anything they wear on the field. Custom Marucci gloves, sure! How about that “Gumbo”-colored I-Web for assistant coach Tommy Nicholson? You can get pretty close to that one here. A couple of looks at UNC’s new threads, courtesy of @DiamondHeels. Another Nike MVP Pro 2 entry, this time with “elephant” print. Thanks, Michael Jordan. We’ll be adding a lot of college stuff over the next few weeks, especially on our Instagram. Check us out there, and as always, if you see something, say something.